MRTeam was thrilled to compete in the very first race meeting for the recently relaunched Eastern Creek International Raceway, now known as Sydney Motorsport Park. 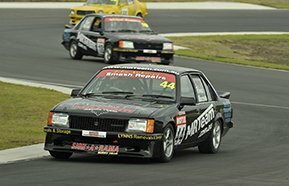 Round 3 of the NSW Motor Race Championship was held on Saturday 9th and Sunday 10th of June on the new 4.5km Long Circuit. There were a lot of different competitors that attended for the historic event, including a few from interstate. We are very happy to report that with the combination of suspension upgrades carried out last month and the use of the new Yokohama 050 tyres, there was a big improvement in the performance and drivability of the cars. Though we are unable to compare our times from previous race meetings as we were competing on a new circuit, Ryan and Reece found they had more speed and better handling over the original section of the circuit. The next stage of our development work will involve driveline assembly upgrades for both cars. Full details of race times and results can be found on our results page. We really enjoyed the experience of competing with a different mix of drivers and it was good preparation for when we travel interstate ourselves. The close and competitive racing over the weekend made the event all the more fun! A huge thanks goes out to our family and friends for their support over the weekend, and as always, a huge thanks goes out to all our wonderful sponsors: Lynns Removals & Storage, McVey's Transport Ulladulla, EmbroidMe Penrith, Signarama Surry Hills and Wishart's Paint Solutions. Written by Chris Dobie – SouthernDrive.com.au SHOALHAVEN motor racing outfit MRTeam have proven they are serious about their... Read more. On Friday 23 November MRTeam Accompanied the Today - Weather Segment at Sydney Motorsport Park for the 'Celebrating Motor Racing... Read more. MRTeam enjoyed a very exciting and eventful weekend on November 3/4 at Goulburn’s Wakefield Park Raceway for Round 6 of the NSW... Read more.